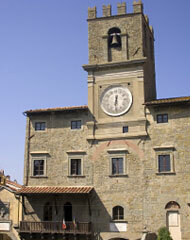 What can I find near Hotel Locanda dellAmorosa? 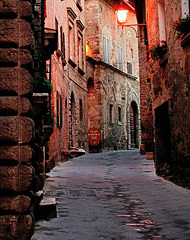 A great part of Locanda dellAmorosas charm lies in its enchanting location. In fact, guests fall in love not only with the hotel, but with its surroundings  a land of age-old towns and villages, breathtaking scenery, and artworks of quite inestimable value. For centuries defended, celebrated and cared for by those who live here, this beautiful part of Tuscany has survived the passage of time unscathed, largely thanks to the intelligence of the people who inhabit it. The area is too rich in interesting sites for us to list them all here, but this will not stop us from trying to give guests a taste of the Tuscany we know and love. Our recommendations have been compiled in the form of a friendly, insiders-guide to the area, created to ensure you make the most of your time here, and return to the Locanda dell Amorosa filled with the same enthusiasm that we feel, each time we pay a visit to one of our local churches, medieval hamlets, or simply go for a ride in the countryside. Everyday a new route to follow, new towns to explore, new emotions to experience. Perched on a narrow ridge of land, some 600m above sea level, Montepulciano is the highest of Tuscany's hill towns, the carefully conserved treasures of which bear witness to its turbulent past and alternating allegiance with Siena and Florence. 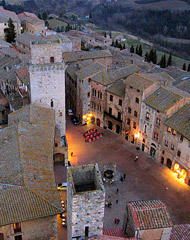 A vibrant and wealthy town since Medieval times, the center of Montepulciano is home to a magnificent group of historic buildings. 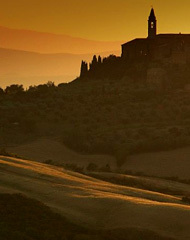 In the surrounding countryside, one of Tuscany's finest wines - the Nobile di Montepulciano, is produced. Built upon the green hills of the Val d'Orcia, for many, Pienza is the ultimate expression of the spirit of the Italian Renaissance. In the 15th century, the architect Bernardo Rossellino was commissioned by the ambitious Pope Pius II to completely rebuild this, his hometown, and since then, the beautiful architecture of his Utopian 'new town' has remained, amazingly, unaltered. 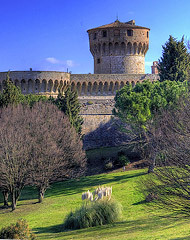 In the 13th century, Monticchiello served as military outpost for the Republic of Siena. The first sight of the perfectly conserved walls and entrance gate are one of the highlights of a trip to this little village. Today, Monticchiello is famous for its community theatre and the open air performances in which members of the one hundred strong population recount episodes of recent history to enraptured audiences. 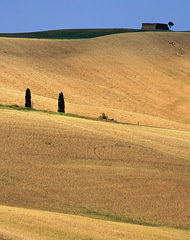 Nothing can quite compare with the "lunar landscape" of the Crete Senesi, the sparsely populated pale clay hillsides of which provide the stunning location for the Abbey of Monte Oliveto Maggiore. Ambrogio Lorenzetti's 'Effects of Good Government', in Siena's Palazzo Pubblico, testifies to how this area of the Sienese countryside has remained almost unaltered by the passage of time. Founded, according to a decidedly dubious 17th century account, by Noah, one hundred and eight days after the universal flood, Cortona is one of the principal art towns of the Val di Chiana. Among the many sites to be visited, those absolutely not to be missed include Cortona Cathedral, with its medieval Romanesque facade and the Etruscan Academy Museum, home to numerous important Etruscan bronzes. 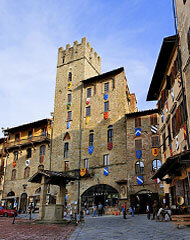 In medieval times Arezzo was a flourishing commercial city, home to animated cultural exchange and one of Italy's first universities, founded in 1252. Today Arezzo celebrates its historic past by way of the annual Giostra del Saracino, contested by the four old quarters of the city, in which jousting knights on horseback and flag throwers entertain the hundreds of spectators gathered in the city's Piazza Grande. 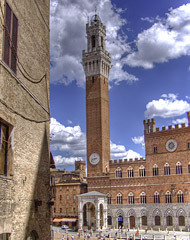 Traces of Siena's rich historical and cultural past can be found in each and every one of the city's ancient streets and alleyways, in its elegant palazzi, and in the Piazza del Campo where the legendary Palio horse race is run. Frescoes by Duccio di Buoninsegna and Ambrogio di Lorenzetti are just some of the many medieval masterpieces conserved within Siena's walls. The castle of Monteriggioni was one of Tuscany's most important works of defensive architecture, built to protect Siena from Florentine attack. 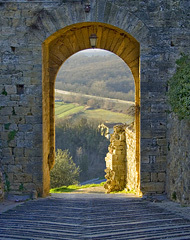 This sleepy piece of medieval Italy, with its beautiful Church of Santa Maria Assunta and ancient little roads lined with craft shops, comes to life, dramatically, during Monteriggioni's annual Medieval festival. Colle di Val d'Elsa is famous for its excellent wines, well-established organic farms and, above all, its crystal industry - the town's crystal manufacturers being responsible for 15% of the world's production. The turbulent history of Colle di Val d'Elsa, famous site of the 1269 battle between Guelfs and Ghibellines, is closely linked to that of nearby San Gimignano, Monteriggioni, Poggibonsi, Radicondoli and Casole d'Elsa. Chianti is the area of vineyard carpeted countryside stretching between Florence and Siena, in which some of Italy's finest wines are produced. 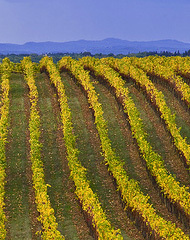 Awarded the DOCG status back in 1987, Chianti wine is one of Italy's most highly prized exports. The Chianti region is famous not only for its wines but also for its attractive little hill towns, towns such as Greve in Chianti, Radda in Chianti and Castellina in Chianti. Situated on the ancient Via Francigena, the small hilltop town of San Gimignano appears before the visitor in all its perfectly-conserved medieval glory. 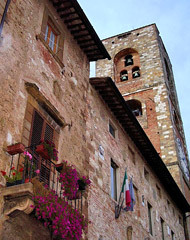 The historic center is enclosed within ancient 13th century walls and still boasts 15 of the original 72 towers built by the medieval merchants of San Gimignano, as symbols of their economic power. Articles created with the alabaster from the local mines fill the shops lining the streets of Volterra: an ancient town of Etruscan origin, in which the traces of diverse periods of history can be seen. Here, the Etruscan Porta all'Arco, the roman amphitheatre, the medieval Palazzo dei Priori and various modern archaeological sites co-exist perfectly, all surrounded by a splendid natural landscape. And you call this a hotel? It's more like a palace! The atmosphere is so enchanting, it's almost surreal! 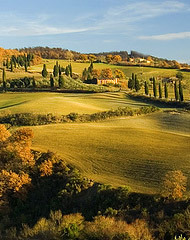 The location was perfect for us, given that we wanted so much to explore the Tuscan countryside.